A few years ago, I had the opportunity to review a DVD that promised to teach theology to little kids. We really did enjoy that movie, and I keep thinking I'd like to get more Theo DVDs. But the kids are older, and I wasn't sure it would still be something they would watch. Then I got the opportunity to review The Good Rat as part of the Family Christian Blogger program. This book features Theo, Luther, and Belfry, and I found that this is definitely something that still has some appeal to my family. The Good Rat is a retelling of the story of The Good Samaritan. And it is a pretty good retelling. My 17-year-old read through the book a couple of hours ago, and his comment was, "They really nailed the story of the Good Samaritan. Rats are a really good representation of the Samaritans." He's right. Basically, this story involves a shrew heading off for town in his best outfit. He is ambushed by weasels (you can vaguely see that in the photo below), who take his money, his beautiful vest, and leave him half dead. The church mice (Luther and Belfry, below) come by, but they are on their way to play rugby and even though they know they should help, they don't. A hedgehog comes by, but she's on the way to market to sell her scarves and quilts, so she only assures the unconscious shrew that someone will be along shortly before she heads off. And then comes a rat. Even though it will make him late for a job interview, he stops, tends to the shrew, and carries him to Theo for further healing. The story directly asks who was a good neighbor, and it directs you to Luke to read more. The illustrations are cute. The text includes some big words, but is great for reading aloud (or stretching a young reader a bit!) Trina read it herself, fairly successfully. She needed some help! 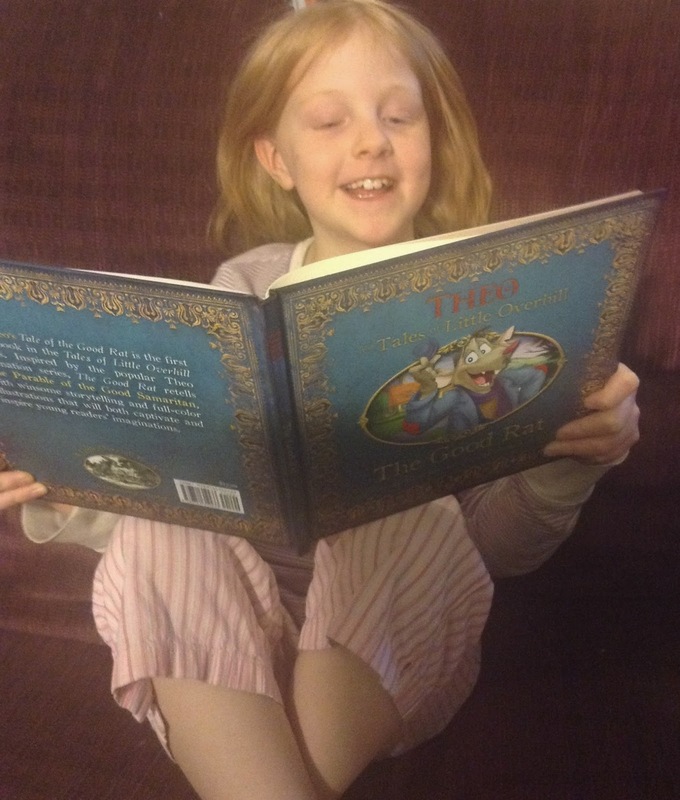 She loved the story, but she said I had to be sure to tell everyone that "I still don't like rats!" I have a $10 appreciation certificate good at Family Christian to give away. That is almost enough to purchase this book, or you can get something else! They have sewing and craft supplies! I need more fabric for my daughter's quilt. There are always books on my wish list. It's been a long time since I've browsed through Family Christian so I may end up with a gift for a friend -- mug, jewelry, etc.